In April 2015, I signed up for a Talkspace membership because my mom and I were headed to India to do a yoga teacher training. Facebook ads had already targeted me (late 20s single female) and shown me Better Help. After some research and comparing the two, I decided to try Talkspace out. I initially thought I’d use it to help mediate the inevitable mother-daughter tensions of 8 weeks traveling together, but it ended up being a place for me to talk through all my experiences for an extended time. As of this writing, I’ve been working with my same Talkspace therapist for almost two years. In September 2015, we met in person for a 2-hour session, which really helped us know and understand each other better. My online therapist has been a critical resource in my being able to continue as a digital nomad for 30 months and counting. Keep reading for more information about my consultation, my therapist, and my experience. Here are the questions Talkspace asked during the initial consultation and some excerpts from my responses. Can you please share about your previous experience with therapy, if any? If there were things you found really helpful or things that were difficult for you, it is good for us to know. My sister and I went as kids when my parents got divorced. He always asked how we felt, but never told us anything else. I stopped going as soon as I could get out of it. On the other hand, the counselor my family started seeing when I was in high school (I went on a sporadic basis) was really helpful to me. She calls us out when we’re behaving unproductively or thinking the wrong way, gave us concrete things to work on, and made issues / relationship dynamics seem very manageable and fixable. Do you have any ideas about how long you expect you will need therapy? Any concerns as to the timeline? Not really. I’ve been wanting to go back to therapy for a while with my family therapist at home, but it would be through Skype and it’s hard for me to schedule and also is outside my current budget, so I thought this would be a good thing to be able to start immediately and have as a consistent place to work through things I’m thinking about and encountering in my life. So maybe it will last a few months, maybe years. But I’m not facing any huge issues or struggling with anything debilitating, and I don’t have any major life deadlines / milestones coming up (other than the trip I’m currently on with my mom). Is there anything else you think would help for me to consider in choosing a therapist for you? I tend to be very over-analytical, so I think I’d want someone who can be very thoughtful and helpful in a practical way and is good at expressing themselves in writing. Of course, I like it if someone is nice, but since I’m not really struggling with majorly challenging issues — it’s more about having someone to ask me questions to get me thinking and give me good feedback / things to work on. It doesn’t need to be as much of psychological support and more so is kind of philosophical / personal discovery. I can’t speak to the quality or experience of working with any of their other therapists, but I feel like I was matched very well and have had a great experience. Without disclosing any of her personal information (for both our sakes): She is a professional therapist, and her credentials include being a LMHC: Licensed Mental Health Counselor (Master’s in Counseling and/or Psychology, plus supervised experience, thanks Wikipedia). 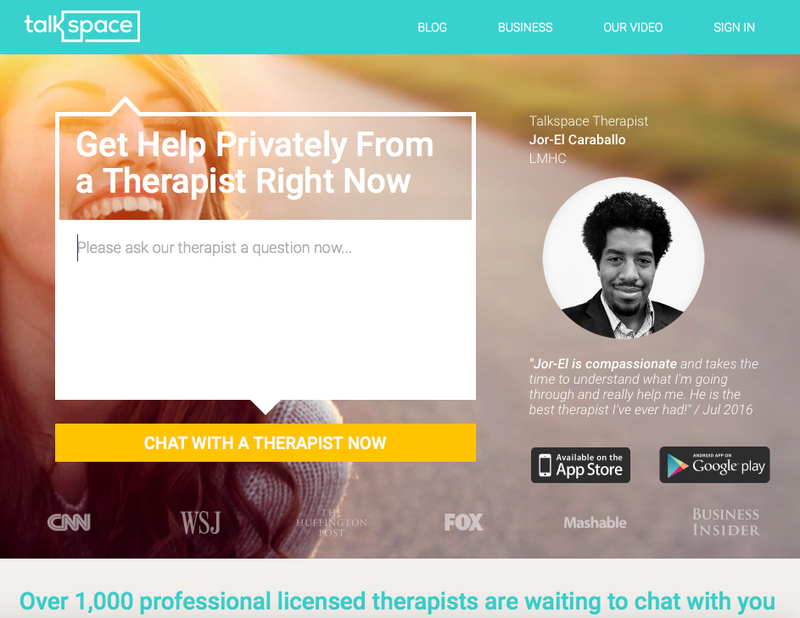 At Talkspace we have an extensive, nationwide network of licensed therapists. All Talkspace therapists have been carefully vetted and trained to use Talkspace. We do not use interns or therapists who are not fully licensed and still under supervision. All of our therapists have over 3,000 hours of clinical experience. Once I began communicating with her, I found myself starting to better understand the boundaries I wanted and needed to have in my other relationships. Instead of dumping on friends when I encountered a crisis situation, I had an appropriate outlet for a long meltdown email during a rough moment. I also know that I will always get a timely, thoughtful response and that our conversations are intended to be primarily one-sided. Now that we’ve known each other for such a long time, she’s witnessed people come and go from my life, the relationships I’ve had and how they affected me, when I’ve had a hard time and when I’ve been in a healthier place, and so forth. When she asks me a question, even if it prickles, I’m able to trust her intentions are objective and productive, so I consider her suggestions more thoughtfully than I might be able to coming from another person in my life. She’s not a parent, lover, friend, or coworker — she’s a third-party trained in mental health. She’s not invested in any of my personal choices and doesn’t have any particular hopes and dreams for my life; her role is to ask me questions and guide me through making healthy, responsible choices for myself (and ideally, those around me). To be clear, I am not diagnosed with any clinical depression, anxiety, or anything else that requires medication or monitoring. But, like all people, I have struggled with the highs and lows of life, and I’ve found it very valuable to have a trained professional available to listen, ask productive questions, and provide insights. We hire accountants for our taxes, lawyers for our businesses, and doctors for our bodies — why not have professional guidance for our minds, helping us face new situations in life that we aren’t sure how to process or approach? Talkspace has been an affordable and readily available way for me to have a resource and guide through the experiences and challenges of living on the road, dating and breakups, family dynamics, professional changes, world events, and all my other victories and traumas, big and small. This link will get us a mutual discount if you join. I don’t recommend Talkspace for the hope of future kickbacks. I recommend it because it’s had a tremendously positive impact on my life and my psyche. Katherine is a digital nomad, working remotely while she travels the world — on the road since June 2014. She’s a member of Remote Year 2 Battuta, living around the world with 75 other digital nomads from February 2016 to January 2017. Please click the ❤ below to recommend this essay :) Thank you! Questions + feedback welcome in the comments. Want more? Follow along here on Medium and sign up for my mailing list.